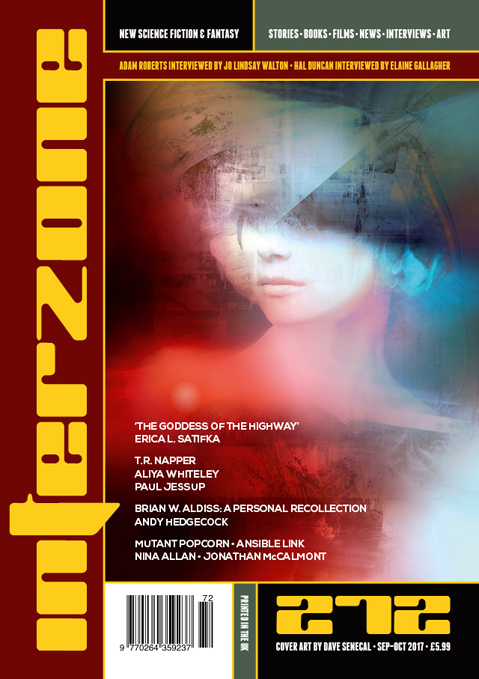 "The Goddess of the Highway," by Erica L. Satifka [bio] (edited by Andy Cox), appeared in Interzone issue 272, published on September 15, 2017 by TTA Press. Pro: The caste hierarchy is interesting (and a commentary on the gradual loss of upward mobility in today’s society) and the author does a great job of revealing the details gradually without infodumps. Spike is a spoiled rich girl out of her depth. The more we learn about her, the less heroic she seems. It’s to her credit that she’s trying to fix things, but it gradually becomes clear that she hasn’t really got a clue. When she decides that maybe she should call other Platinums for rescue, it’s clear that she’s never viewed this as high stakes for her personally—it’s more of a game she plays. Harp is a good guy in an awful situation. The more we learn about him, the more heroic he seems. Against almost impossible odds, he fights so hard to do the right thing. It’s he who rescues Spike from the Silver lady. Fittingly, he takes a serious role in the revolution—they needed an electrician—and she becomes a janitor for lack of real skills. Con: The Goddess of the Highway never gets explained properly. We can imagine that the mist was some sort of nanotechnology, but the Goddess seems to be purely supernatural in a story where everything else has a scientific explanation.